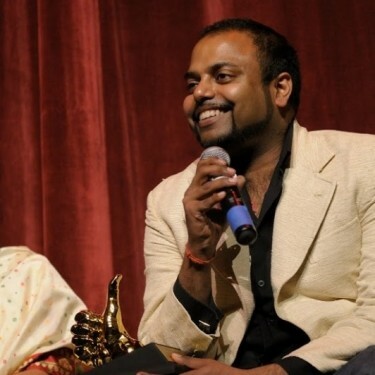 Filmmaker Prashant Bhargava passed away on May 16, 2015. He was 42 years old. Bhargav was a young, talented filmmaker, who is deeply mourned by his fans, friends and family. Bhragava had a brilliant eye and ear for stories, details and colors. His films like “Patang,” and “Radhe Radhe,”were visually stunning. I had an opporuntunity to interview Bhargav over the phone about his film “Patang,” which showed at the 3rd I San Francisco International South Asian Film Festival. This was in 2011 when there was still quite a bit of residue buzs from “Slumdog Millionaire.” Bhargava and Danny Boyle shot the film in India around the same time. In the interview we spoke about the making of films, India and how films are India’s brand ambassador. When you listen to the interview it strikes you how thoughtful and reflective his answers were. It is that same thoughfulness, reflection and authenticity that Bhargava tried to capture in his films. “Patang” is a superbly made film. Shot in the old city of Ahmedabad in Gujarat the film celebrates the “magic of everyday” as Bharagava describes it. “I was born and raised in Chicago and wanted to make a film about a place that captured the pride and exuberane,” he says “I had to let go of my perspective. I spent 3 years researching Ahmedabad and earn the trust of the people,” he adds. The rhythm of the narrative in “Patang” is reflective of the experience Bhargava had in Ahmedabad. He would ask his actors to sit silently in a corner of a street in old Ahmedabad and just watch. By the third hour you saw the whole landscape unfold in front of you and you start noticing things Bharagava says. That is when things would come together. Similarly in “Patang” the story actually comes together towards the end. Even though Bhargava had a prepared script, only 3 out of the 40 cast members read the script. He wanted his actors to be sincere and wanted them to live on screen. We also spoke about why he shot the film in Hindi. Bhargava says he chose to go in the middle and go with Hindi and not with English or Gujarati. If you did it in Gujarati then it would become a regional film he says. A major challenge for filmmakers is distributing their film and that is a topic that Bhargava was very passionate about. He talks about the challenges of distributing “Patang.” Even though it premiered at the prestigious Berlin Film Festival and was shown at many other festivals around the world it was still not easy to distribute the film. Bhargava also talks about how his film gets praised and destroyed simultaneously. How does he deal with that? He was very clear that his films are not meant for everybody. “We make films for a certain group of people.” And clearly that certain group of people enjoys his films and visual storytelling. “We broke rules and genres when making this film,” he says. Towards the end of the interview Bhargav quotes a line from “Patang.” “We hold on to our past with sadness but to the little victories with happiness.” It is those little victories that Bhargava taught us to celebrate in this film. “Patang ” is a film about the magic of everyday. You can watch Bhargava’s films “Ammaji” and Sangam” online.